Harmony has undertaken a marvel of engineering at Hidden Valley, which at its highest point is 2,800 metres above sea level, lying atop a range of steep sided, cloud-covered hills in the middle of tropical jungle, winning praise from hardbitten analysts. “This is extremely impressive. It’s an awesome project,” said David Davis, a gold analyst from Credit Suisse Standard Securities who visited the site two and a half years ago, when a tiny camp had been carved out of the jungle. In the space of two years, Harmony has built a A$20m, 40km road through the hills and valleys to the mine; all the on-site roads; accommodation for 2,000 people, and over-burden stripping. It has also prepared platforms or level ground for processing plant; ore stockpiles and tailings dumps. “The infrastructure surrounding the mine is robust given that real estate is at a premium in the valleys and peaks of the area,” Davis said. The 4.2 million tonne per annum processing plant can possibly be squeezed to handle another 10% of material, but that is the maximum because the lack of space on the platform for any major additions. Another constraint is the lack of tailing dam space near the project. The two planned dams can handle 42 million tonnes, but Harmony has a longer-term scheme to build another tailings dump. It will hold up to 70 million tonnes, some 20km away, and involves tunnels and pumping. It will also allow it to seek out and exploit high-grade satellite pits. The metallurgical plant has been designed to cater for a number of types of gold mineralisation which includes sulphitic material, manganese and haematite present in the Hidden Valley, Kaveroi and the nearby Hamata ore body. “This mixture will be blended prior to processing, but could present some problems in the commissioning phase,” Davis said. Hidden Valley and Kaveroi are open at depth and are thought to join down dip underground. The ore bodies will be mined in a single pit while exploration will explore the coalescence of the deposits. “Hidden Valley is going to be a great, low-cost, safe mine. It’s open pit, international and this all adds up for Harmony. It’s going to generate money,” said CEO Graham Briggs. The A$489m mine will produce 3.4 million oz of gold and 49 million oz of silver over its 13 year life according to the feasibility study based on current reserves as well as expectations that the Karevoi ore body will generate between 800,000 and one million oz of reserves from the latest drilling programme. At current prices, the payback is expected to be three years. The project, which begins production in March 2009 and is set to reach full production in June, will be the first major opencast mine in PNG for at least 15 years and it is the first to pass the new environmental act. Unlike its peers in PNG, Harmony is the first since the failed attempt by Ok Tedi, more than a decade ago, to build major tailings dams. 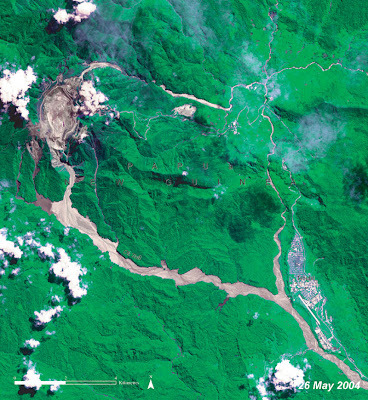 Other miners dump their tailings into rivers or into the sea, aggravating communities and environmentalists. Harmony is seeking a partner on the nearly $2bn Wafi/Golpu project because it doesn’t have the cash and the partner will join it on Hidden Valley and all its other exploration plays. The companies to have made the short list of five are thought to include Barrick Gold, which is aggressively growing its presence in PNG and could be the forerunner in the race to be Harmony’s 50% partner, Newmont, Newcrest and AngloGold Ashanti.